Base of Operations: A small village in the north of Gaul, c.50 B.C. Powers/Abilities: Asterix is very cunning and adaptable. He can use the magic potion mixed by Panoramix to become superhumanly strong for brief periods. 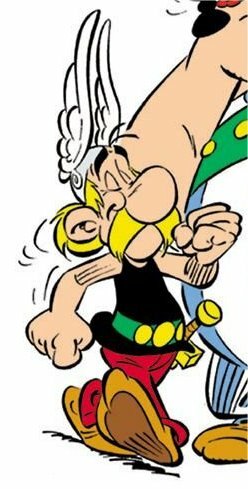 History: (Asterix the Gaul) Asterix is a Gaul in Roman times, living in the only village to successfully resist Roman occupation. He is the smartest of the warriors in the village, and so when anyone must be sent on a mission or adventure for the sake of his village, the job inevitably falls to him (and his constant companion Obelix). (Asterix and the Golden Sickle) Asterix and Obelix travel to Lutetia (Paris) to get Panoramix a Golden Sickle he desperately needs. There they investigate the disappearance of Obelix' cousin, Metallurgix. (Asterix and the Goths) When Panoramix is kidnapped by Goth raiders, Asterix and Obelix travel to Germania to rescue him. (Asterix the Gladiator) After the Romans capture Assurancetourix (Cacofonix in the English translations) and send him to Rome to be thrown to the lions, Asterix and Obelix become gladiators so they can save him. (Asterix and the Banquet) The Romans barricade Asterix' village and try to starve the Gauls out, so Asterix and Obelix set off around the country gathering ingredients for a sumptuous banquet. (Asterix and Cleopatra) Asterix travels to Egypt and meets Cleopatra. (Asterix and the Big Fight) A thrown menhir temporarily robs Panoramix of his memory, just when it is needed most, as the village's chief Abracourcix (Vitalstatistix in the English translations) has been challenged to single combat for the fate of the village. (Asterix in Britain) After the Roman invasion of Britain, one village holds out. One of the Britons, Asterix' cousin, appeals for a supply of the magic potion to help them stay free, and Asterix races to deliver it. (Asterix and the Normans) Asterix has to look after Abracourcix' brattish teenage nephew, just as a Norman raiding party comes to town. (Asterix the Legionary) When the Romans forcibly conscript Tragicomix, Asterix and Obelix enlist and follow him to Africa to get him back. (Asterix and the Chieftain's Shield) Julius Caesar decides to hold a parade with the shield of Vercingetorix, the Gaulish leader who once defeated his legions. To save national pride, Asterix races the Romans to find and secure the shield first. (Asterix at the Olympic Games) The Gaulish villagers are challenged to take on the Romans at the Olympic games. (Asterix and the Cauldron) After promising to guard a cauldron full of gold, the loot is stolen on Asterix' watch. Naturally the two Gaulish friends set out to recover it. (Asterix in Spain) The Romans bring Little Pepe, the kidnapped son of a Spanish rebel, to Gaul, but he is rescued by Asterix and Obelix, who then travel to Spain to return the child. (Asterix and the Roman Agent) Caesar sends an agent undercover into the village to sow dissent and unrest, and it is up to Asterix to outwit him. (Asterix in Switzerland) Asterix and Obelix travel to Helvetia (Switzerland) to retrieve a rare flower which is needed to heal a poisoned man. (The Mansions of the Gods) Caesar orders the destruction of the forest around the village and the construction of expensive flats, hoping to Romanise the area. But Asterix and his friends have other ideas about the re-development of their home. (Asterix and the Soothsayer) A fake soothsayer fools the entire village, except for Asterix. When the soothsayer tricks the other villagers into abandoning the village, it's up to Asterix to unmask him before they lose their homes forever. (Asterix and the Laurel Wreath) After Abracourcix makes a foolish bet, Asterix and Obelix have to travel to Rome to obtain Caesar's laurel wreath to win the wager. (Asterix in Corsica) Asterix frees a captured Corsican chieftain, and then accompany him home to help them drive the Romans out. (Asterix and Caesar's Gift) A present given by Caesar to one of his legionnaires manages to make its way to Gaul and into the hands of Asterix...spreading dissension through the village. (Asterix and the Great Crossing) While out fishing a violent storm blows Asterix and co. off course, and the unwittingly sail all the way to the Americas. (Obelix and Co.) Caesar tries to use greed to defeat the Gauls, turning Obelix into a rich businessman to do so. (Asterix in Belgium) After Caesar describes the Belgians as the bravest of all Gauls, Abracourcix sets off to Belgium to prove him wrong, accompanied by Asterix. Obelix and Panoramix. (Asterix and the Great Divide) Asterix is enlisted by two lovers, children of rival chieftains, to help ensure true love runs smoothly. (Asterix and the Black Gold) Asterix travels to the East to obtain oil, a vital component of the magic potion. (Asterix and Son) Someone abandons a baby on Asterix' doorstep, forcing him to become an unwilling foster father for a while. (Asterix and the Magic Carpet) Asterix takes Assurancetourix to Arabia, where his terrible rain-inducing singing can be used to end a devastating drought. (Asterix and the Secret Weapon) Caesar figures the Gauls will not fight women, and thus sends a troop of female legionnaires to defeat the village. (Asterix and Obelix All At Sea) Spartakis brings his rebelling slaves to the village, and enlists Asterix on a mission to sunken Atlantis. (Asterix and the Actress) Asterix' parents turn up to help him celebrate his birthday..and make his bachelor life a misery. Comments: Created by Albert Uderzo and Rene Goscinny. In the 1970's there were also a series of 16 books with Idefix (Dogmatix) as the star - see his page for details. 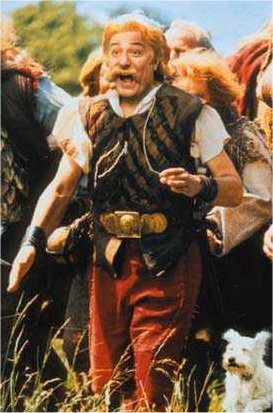 Asterix has also been the star of two live action French movies, Astérix et Obélix contre César (Asterix and Obelix vs. Caesar, 1999) and Astérix & Obélix: Mission Cléopâtre (Asterix and Obelix: Mission Cleopatra, 2002), in both cases played by Christian Clavier. There have been a series of figurines released commemorating many of the Asterix characters (in a manner similar to the plethora of figurines released in the U.K. around Terry Pratchett's Discworld characters). Rather than try and list them, I've found a site which has already done so, complete with a ton of pictures. There has also been an interactive Asterix card game (presumably in the style of Magic the Gathering) released by Spears to begin with, then by FX Schmid. In 1989 Parc Asterix opened, a Disneyland style theme park situated near Paris.